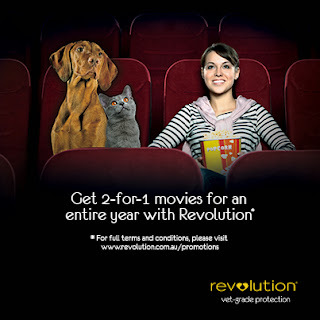 Get 2 for 1 Movies for an entire year when you purchase Revolution! Our pets are family; and our family deserves the best. And until October 31st, VetShopAustralia and Revolution are offering you the best deal in town! When you purchase 2 x 6 packs of Revolution, or 1 x 12 pack, not only will you be providing your pet with vet-grade protection against fleas, heartworm and other nasties, you'll also be rewarding yourself with a yearly 2 for 1 movie offer! Whether it's a girls dinner and movie night, or a romantic evening with your partner, grab some popcorn, sit back and enjoy. Hurry, this offer runs out on October 31st, so buy your Revolution now!